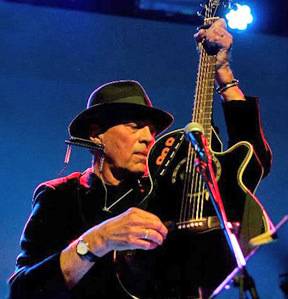 Eric Andersen is a first-generation standout in the Greenwich Village folk revival of the 1960s. At age 20, he was celebrated as an emerging star of the Village folk scene by New York Times critic Robert Shelton, who famously championed the young Bob Dylan a few years prior. His early songs "Violets of Dawn" and "Thirsty Boots" are classics of the folk world. His later songwriting blossomed into beautiful, poetic expressions from a songwriter's songwriter. Over a career spanning 28 releases, he has embodied the popular transition from acoustic American roots music and politically motivated topical song in the ’60s to the mellower, brilliant and more personally inspired singer-songwriter movement of the ’70s and beyond. Eric has been known as a ‘songwriters songwriter’. His songs have been recorded by some of the best, ranging from Judy Collins and Fairport Convention to Bob Dylan, Linda Ronstadt, Judy Collins and The Grateful Dead among many others. Eric’s voice, songs, guitar and piano playing have created a career that has spanned over 45 years. Later in 2017, Sony Legacy Records will be releasing a 40 song retrospective on Eric’s career. There will also be a documentary film on Eric’s 50 years in music entitled The Song-poet to be released next year. Always creative, on the top of his game and ready to show new generations why he is “a singer and songwriter of the first rank” (NY Times) and a national treasure. Joining Eric for this special show are: Cheryl Prashker on percussion, Eric Lee on violin and Steve Addabbo on guitar.